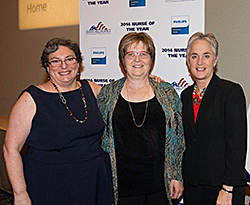 For the third year, NAHC has honored a Home Care & Hospice Nurse of the Year. The Home Care and Hospice Nurse of the Year is determined based on a national vote that includes nurses from all 50 states. Those 50 nurses are chosen by a selection committee that reviews all of the submissions across the country and chooses the top nurse from each state. During NAHC's 2014 Annual Meeting & Exposition, Denise R. Schrader, Chair, Home Healthcare Nurses Association introduced Mary Pistulka, RN, BSN, CHPN, Hospice Coordinator, Avera@Home, Yankton, South Dakota as this year’s winner. Ms. Pistulka has over 26 years experience as a hospice nurse at Avera@Home.